This past weekend Matt and I took an itty bitty teeny-weeny little tiny mini vacation to see the musical Wicked in Birmingham. While I had great plans to sew a skirt especially for the occasion, I just didn’t have enough time to finish narrow hemming four layers of thin, silky fabric before we left. And it’s a shame, too, because one of the leads in the production wore a very similar skirt in one of the scenes of the musical. Instead, I decided to wear a beautiful store-bought dress that has been hanging unworn in my closet for a while. While we were in Birmingham, we stopped by Whole Foods to do a little shopping (but mostly to just look and drool). 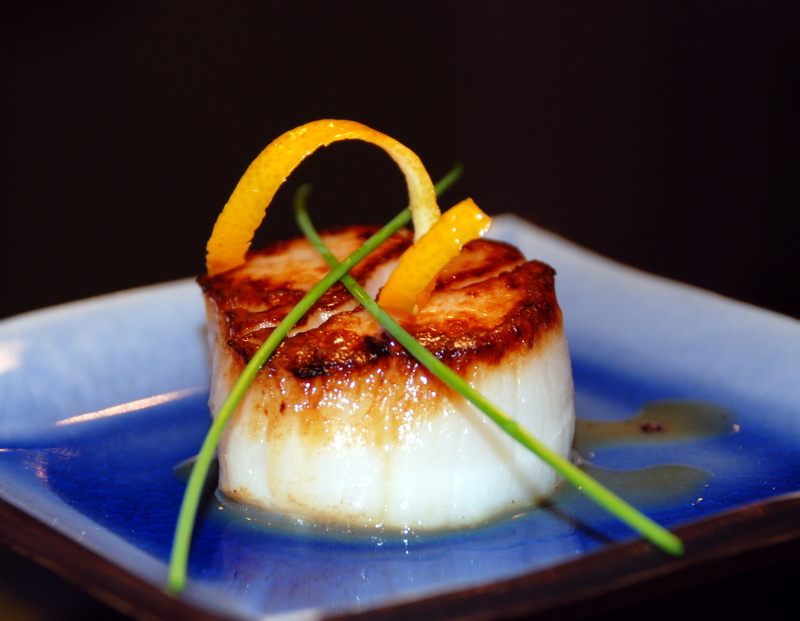 We brought home some gorgeous 10-count sea scallops that I cooked that evening for dinner. Those of you who know me, know that I am a die-hard baker — I love that baking is very scientific and follow-the-directions. I am less fond of cooking since it is more art than science (back to the whole OCD/control-freak bit again). Scallops are one thing that I like to cook, though, thanks to the excellent directions in this cookbook. I first learned about Thomas Keller when Matt and I were in Napa Valley a few years ago. While we didn’t eat at any of his restaurants, I sure wanted to. When we got home, I purchased the French Laundry and ad hoc at home cookbooks. I don’t know that I’ll ever make anything from the French Laundry but I do use ad hoc on a pretty regular basis. The roasted chicken has become a regular on my table (I’ll share it with you sometime), and his ice cream is divine. These scallops are extremely easy to prepare and are almost fool-proof. I recommend waiting until you can find really large scallops — like those that are 12 or less to the pound — so that your dish will turn out successfully. This dish is definitely one that you could serve to impress guests but also works well as a quick, light meal on a busy night (like it was for Matt and I after we spent 4 hours on the road home from Birmingham and made a detour by the state farmers’ market in Montgomery). 1. Try to use the specified brand of Kosher salt. If you can’t find it or don’t have it, measure your salt by weight, not volume. In other words, if you don’t have Diamond Crystal, weigh out 5 ounces of salt — don’t use a measuring cup. 2. Do not use olive oil. Olive oil is not well-suited for high-heat cooking and may scorch. You could use canola or vegetable oil if you had to, but clarified butter really is the best. 3. To clarify butter, simply melt 1/2 stick of butter in a small sauce pan over low heat. Pour it into a small, narrow glass. Let it sit until the milk solids have settled to the bottom and you see two distinct layers. Skim the foam off the top and discard. Carefully pour the clear yellow liquid off the top into another small container (this is your clarified butter). Discard the milk solids that remain in the bottom. 4. Use a stainless steel pan. It will caramelize the scallops better than a nonstick pan. Line a small baking sheet with paper towels. In a large bowl, combine the salt and boiling water, stirring to dissolve the salt. Stir in the cold water. Add the scallops to the brine and let stand for 10 minutes but no longer as the scallops may become too salty. Remove from the brine and rinse under cold water. Place on a single layer on the baking sheet to drain. Heat the clarified butter in a large stainless steel frying pan over medium-high heat until it ripples and smokes. Sprinkle the scallops lightly with salt then add to the pan without crowding (scallops should not touch — cook in two batches if necessary). Cook, without moving the scallops, until the bottoms are a rich golden brown, 3 to 3 1/2 minutes. Turn the scallops and caramelize the second side. Good morning, Susie Homemaker, M.D.! These bad boys really are fool-proof. I prepared these delicious little steaks of the sea last night. That’s right. On a busy week night, while having a glass of wine, while feeding the baby, while the four year old took her bath and brushed her teeth for bed, and while I cooked the other parts of the meal. We layered angel hair pasta tossed in butter and lemon juice, then wilted spinach cooked with garlic, then our scallops. They even turned out great despite the fact that I did not use the correct brand of Kosher salt as the dear doctor had instructed and did not use the pan recommended. I didn’t even use Kosher salt….or measure. I dumped some salt that I had into boiling water, dissolved it, put it with cold water and brined the little guys. I did, however, make clarified butter (two batches, in fact, because the first batch was knocked onto the floor) while cooking the pasta and spinach. The only thing I forgot to do, I’m embarrassed to say, is clean the little guys really well before starting—there was some remaining grit which is always unpleasant. But other than that, really, really easy to make and they, of course, looked amazing when done. Move over, Martha; there’s a new girl in town. recipe. What do you think? for two cups of Kosher salt. I guess he went back and revised it. today. Kinda weird. What do you think? Hi, Robert. Thanks for visiting. I just pulled out my copy of Ad Hoc to double check and it does call for only 1 cup of salt to 2 cups of boiling and 8 cups of cold water. My version has a copyright of 2009. The recipe as given has always turned out for me so I can’t speak for the saltier brine. Interesting that there are two versions. Perhaps the first was a typo? If you email your question to the Ad Hoc restaurant website, you are likely to get a response. I have found them to be very helpful in the past. Hope this helps and thanks again for stopping by! Great idea! I have a feeling he went back and fixed it because depending on what brand of kosher salt you use you could ruin the brine. Different brands weigh different amounts.